Review date: 5 April 2004. 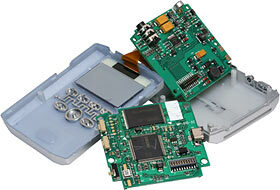 Hard drive based MP3 players are squeezing into the solid state players' market segment. Base model iPods with 15Gb of storage now cost only about 1.5 times as much as the better 256Mb Flash RAM players - about a fortieth as much per megabyte - and the iPod's certainly not the cheapest of the hard disk based crowd. And then there are MP3 CD players. Not as small or convenient as most other portable players, but a great cheap option if you've already got a computer with a CD writer, and who the heck doesn't these days? To compete against super-capacious disk-based players and cheap MP3 CD players, solid state players have to work their strengths, chief among which is smallness. Or they can just sell really cheaply. Here's one example of each strategy. 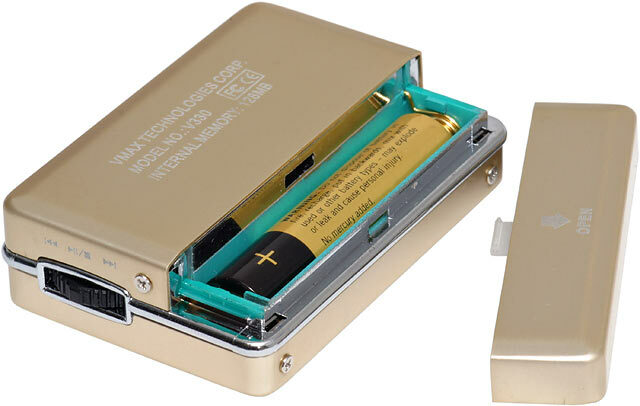 If you appreciate tiny gadgets, you'll appreciate this gadget. 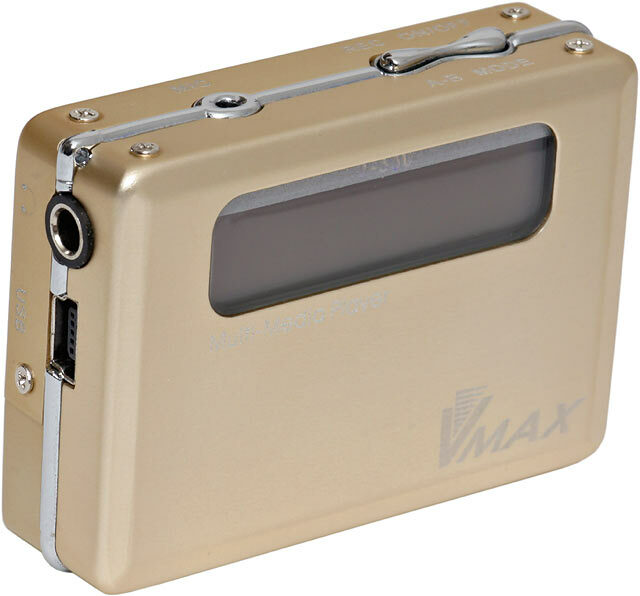 Vmax Technologies' V-330 MP3 player - which is actually officially called "Little Cute" - is really, really small. 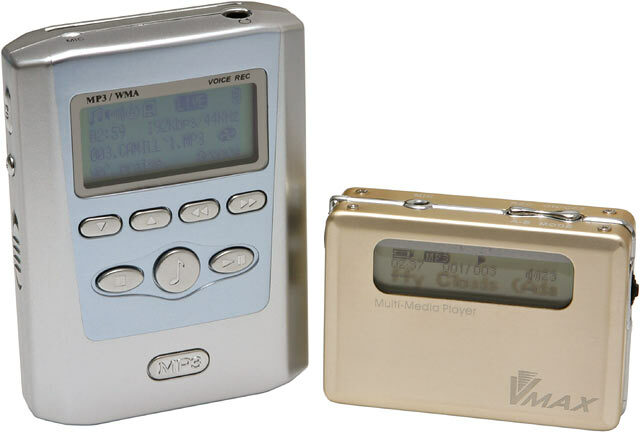 It probably isn't quite the smallest MP3 player in the world (that's hard to judge, anyway; do you qualify them by cubic volume? ), but if it were very much smaller there'd hardly be room for a display on the thing, much less usable controls. The V-330 is 57 by 40 by 15mm in size, and is supposed to weigh "40 +/- 5 grams" with a battery in it. 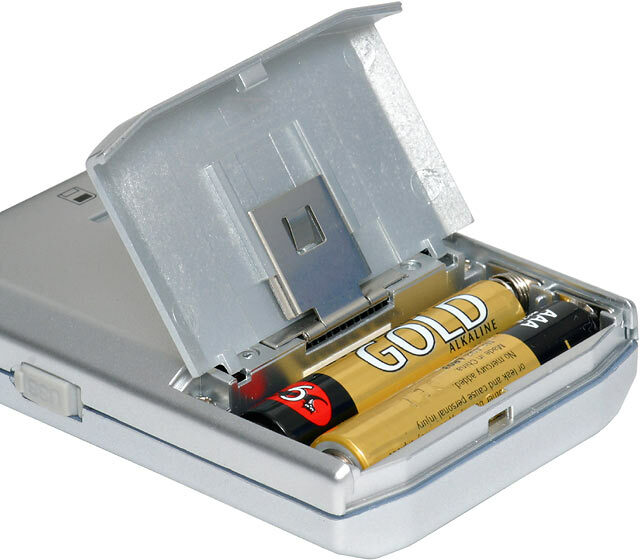 The one I checked out weighs 30 grams without a battery, and 42 with an alkaline AAA cell. And, into this tiny package, Vmax manage to fit up to 512Mb of memory - though the one I checked out has only 128Mb. It doesn't actually have 128Mb of storage, of course; MP3 player makers usually overstate the capacity of their players, and Vmax have done so here. The formatted, 1048576-byte-megabyte capacity of the V-330 is only 121Mb. It may be tiny, but it's not stupidly expensive; when this review was first written Aus PC Market sold the 128Mb model for only $AU165. They don't sell it any more (click here to see their current mp3 players). The V-330's battery bay cover is made of plastic, but the rest of the player's casing is gold-anodised aluminium (other colours are apparently available, but not from the people who gave me this one). The metal casing gives the player a very solid feel. In the smallness stakes, the V-330 is clearly a winner. It's a matchbox. It'll fit snugly in the "Zippo pocket" of a pair of jeans. Blink and you'll miss it. It also, however, has a respectable feature list. MP3 and WMA audio playback at all bit rates, of course, but also a voice recorder with integrated microphone (which is, as usual for these things, quite up to normal microcassette-recorder sorts of tasks), and an FM radio. And the ability to record from the radio. And, unlike the last radio-recording player I checked out, this one can record full uncompressed CD quality stereo from the FM tuner, if you ask it, for as long as its memory lasts. Actually, the V-330's list of FM recording sample rates goes all the way up to 48kHz, beyond CD's 44.1kHz, but there's not that much quality in FM radio so there's not much point wasting space with the highest settings. The Little Cute's screen (which has the usual blue electroluminescent backlight) is, inescapably, cramped. 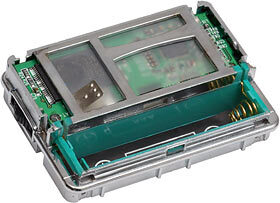 The active display area's only about 30mm wide; only so much stuff fits on there. The controls get in the way a bit, too, because there aren't enough of them. This, in fact, is the entire control contingent. One two-way lever that you can click inwards, and two other buttons. 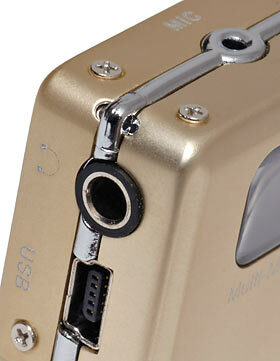 On another corner, there's just the microphone input, the mini-USB socket, and the standard 1/8th inch headphone jack. The headphone socket looks like a big quarter-incher, but that's because the player's so small. The way the Little Cute's controls work is mildly weird. You click the lever in for play/pause, for instance. Weirdness is forced upon the Little Cute by its lack of buttons, though; the lever can't control volume and skip/seek at the same time, so the designers decided to make it do skip/seek by default. 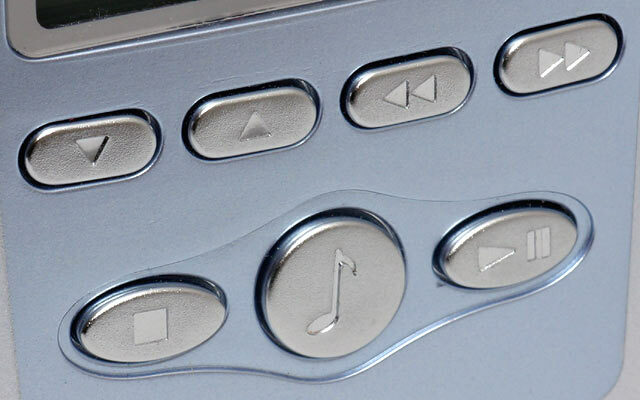 You have to press a button, and then the lever in, to access volume control mode. Overall, the Little Cute's interface could be much worse. You don't have to navigate past a questionably useful EQ Set menu on the way to select something more useful, and there's an in-player file delete function (useful for tidying voice notes). The only thing that's missing is a Hold function to lock the keys, but they're firm enough that you shouldn't push them by accident too often. People who own one of these players will definitely find themselves squinting at it at lot; the multi-press interface and somewhat sluggish response (many single-cell-powered MP3 players don't respond very snappily to control input) mean you can't do even some very basic tasks without looking at the screen. Oh, and that screen is slightly bulbous, and so might be easy to scratch. That's pretty much the end of the Little Cute's bad news, though. The good news is that its setup interface works quite easily, and lets you do one unusually cool thing. You can, you see, choose uncompressed PCM, MS ADPCM or IMA ADPCM encoding for FM and microphone recordings. Encoder choice is odd by itself; the choice of two flavours of four-bit ADPCM (in case you want to play files back on a system that only understands one or the other...) is something I've never seen before. Four-bit ADPCM is a computationally cheap, mildly lossy audio compression system, not nearly as good-sounding per bandwidth unit as MP3, but still good for a roughly 4:1 compression ratio without serious quality loss. 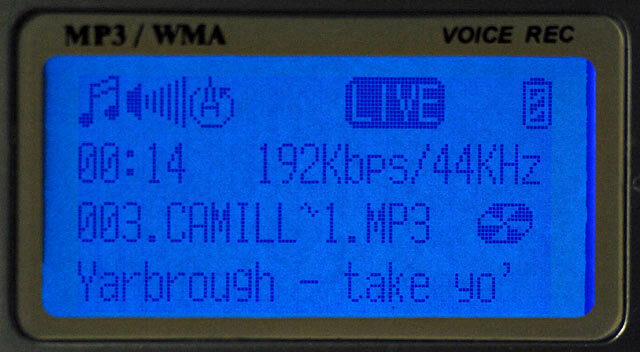 You can fit an easy 45 minutes of FM-quality recording into the "128Mb" V-330's memory (assuming you don't have anything else in there already). Or lots, lots more, if you drop to mono and use a lower sample rate. The V-330 supports sample rates down to 8000Hz. You can choose from the same three encoding options for recording with the V-330's internal microphone, and the same wide range of sample rates (though, sensibly, not stereo mode), but there's little reason to use a sample rate above 8000Hz just for voice. 8000Hz, along with either ADPCM encoder, gives the thick end of nine hours of recording space even on this low-capacity player. The V-330 comes with an unusually large selection of extras. One USB cable, of course, and one pair of the traditional super-cheap Crapê Audio earphones (this time with in-line volume control, in case you care). But you also get a minuscule fake leather pouch with a belt loop that's too small for most belts, but which fits the also-included elastic arm strap. And, miraculously, both of these items are basic black, not some iridescent pastel sheen that the average candy raver would consider excessively kawaii. There's a little clip-on lanyard arrangement as well, for hanging the featherweight player from your collar, backpack strap or whatever. 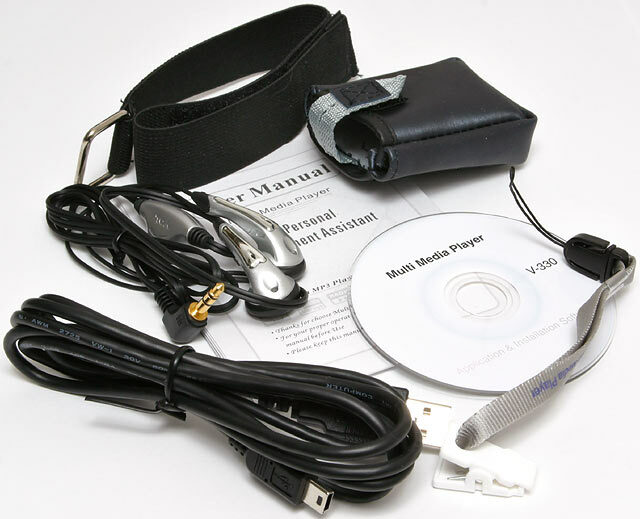 The 77mm software mini-CD contains the usual Win98 driver software (users of later Windows versions don't need a driver), plus a Vmax Media Player program of severely limited value, and a firmware update program as well. There's a special format utility, too; this is one of those players that'll lose its brain if you just format it like a regular drive. You'll only need to use the format utility if the player's filesystem gets screwed up, probably by accidental unplugging during a write operation. There's no documentation for the V-330 on the CD, or on Vmax's download page, but you get an only slightly puzzling paper instruction sheet with it. 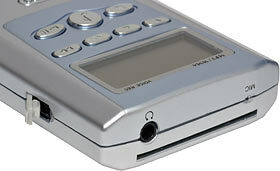 Which, by the way, informs you that the V-330 is "Your Personal Entertainment Assistant". This player's allegedly made by Sunrich Technology, though its packaging is brandless, and people around the world no doubt sell it under the usual motley mixture of names. It's another product from one of those gadgets-to-order Chinese factories that supplies umpteen "manufacturers", some of whom don't even pay to have their own brand printed on the product. 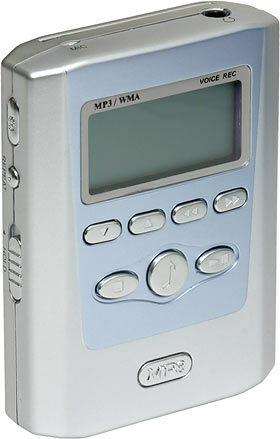 Sunrich's MP3 player product page apparently used to have this player on it, but now it's got the one I reviewed here. So, what to call this thing? Well, it's out of my hands. It's already been dubbed "Dan". Dan's much bigger than the Little Cute player, but it's still not a big device. I weighed it at 69 grams with batteries (two AAA cells for this player). It'd rattle around inside the average cigarette packet with room to spare. Dan has the same basic feature set as the Little Cute, but without the FM radio. 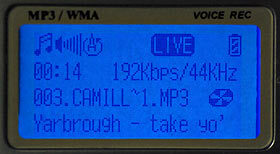 If all you want is MP3 and WMA playback and voice recording, it fits the bill. Dan's three chief advantages are price, price, and price. It's got 128Mb of memory (124Mb, in the real world), and when this review was first written it was selling at Aus PC Market for only $AU126.50. But there's more. 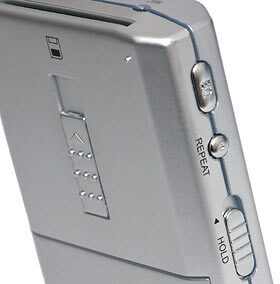 You also get a SmartMedia (SSFDC) expansion slot, which lets you plug in up to another 128Mb (or near offer) of memory. The player sees all of the memory at once - you don't have to remove the card to play music from the internal memory. You do, however, have to remove the card if you want to access the internal memory via USB. You can see the internal memory or the card memory at any given time. You have to unplug the player from the computer to make the swap. This memory division also means that files can't be split across the two blocks of RAM. If you've got 3Mb of internal memory free and 3Mb of card memory, there's no way to add another 4Mb file. None of this is a really hideous limitation, though, given (once again) the price. Aus PC Market sell 128Mb SmartMedia cards for $AU99 delivered, but I don't think they'll mind me pointing out that you can find them for substantially less on eBay and elsewhere. And you may, of course, already have one kicking around; at last, something to do with the perfectly fine memory card from that camera you dropped off a balcony. ...and a Hold switch. 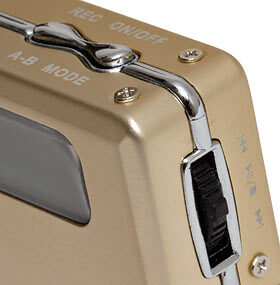 The slider on the back of the casing ejects the memory card. I like Dan's battery bay (there's something I don't remember writing before). It slides out and hinges up, so you can't lose the bay cover - and the metal hinge is surprisingly solid. As is the rest of the player. Dan only has a plastic casing, but it doesn't flex or creak. Dan's USB socket has a hinged rubber dust cap. The headphone socket's another 1/8th inch one, of course; on this player it looks the right size. You don't get a whole lot of extras with Dan. Another pair of NastiSonic earphones (buy something better! ), one USB cable, one software disc containing nothing of great interest, and a decent little paper manual. Dan's screen also isn't fabulous - it's a bit washed out compared with the Little Cute's, and no adjustment of the contrast setting improves that. It shows filename and ID3 data and the usual other basic info, though, and it's got a lot more real estate than the Little Cute's micro-screen. It'll do. Both of these players offer a selection of equalisation modes, including the usual bass-boost-for-tiny-headphones and other modes alleged to be suitable for Classical or Pop or Rock or something. Both of them also have a flat Normal mode, though, and both of them sound pretty good when you select it. The Little Cute player only apparently has 5mW earphone output, but it drove my big Sennheiser HD 590 reasonably strongly, and the sound quality didn't go to hell at full volume. If you really want to cut through background noise then an outboard amp will be in order, but with decently efficient headphones - in-ear "canalphones" are an excellent choice, if you can stand their ear-pluggy feel - the Little Cute should be able to give you a fine headache without one. The Little Cute's FM radio uses the standard portable technique of using the headphone cable as its antenna, so its performance is highly variable. It wasn't awful, but I've definitely used portable radios with a better tuner than this. You also can't lock the tuner into mono mode to avoid noisy stereo. But hey; it's got auto-scan, it's got presets, it pretty much works. Users in remote areas need not apply. Dan drove my HD 590s moderately well, but, again, not loudly enough to cut through serious background noise. Again, you can use an amp or sensitive in-ear 'phones, or just make like a DJ and wear a giant set of closed-back noise-blockers around town. Both of these players have the usual USB1.1 interface for connection to a PC or Mac; the Little Cute needs to be turned on to connect, but that's it for quirks in this department. Both players should be plug-and-go propositions on every Windows flavour after Win98, and may or may not work right on recent Mac OS and Linux versions. The Little Cute player scored an unusually high (for an MP3 player) read speed of about 860 kilobytes per second when I tested it. Its write speed was a healthy, but unremarkable, 580k/s. The Dan player managed a pretty-average 590k/s for reads and 530k/s for writes, when I tested its internal memory. It may be slower for reads and writes to some SSFDC cards, especially that 16Mb one that's been sitting in your desk drawer since six weeks after the format was invented. The V-330's meant to run for at least ten hours from one AAA cell, and I can believe it. In playback mode, it drew about 60 milliamps through my ammeter when its backlight was off (which it will be, most of the time), and 80mA when the light was on, regardless of the volume setting. Into that sort of load, a decent quality AAA alkaline (PDF datasheet here) ought to give a comfortable ten to eleven hours of service. Dan drew about the same current as the Little Cute; maybe 65mA through the ammeter when playing with its backlight off; about 80mA with the backlight on. Dan clearly isn't as efficient as the V-330, so you can expect about the same life from two AAAs in Dan as you can from one in the Little Cute. The Little Cute player's metal case is held on by minuscule sub-eyeglass-sized screws, which are easy enough to remove. But when you take the case apart, you're greeted by an unexpected shower of little loose metal tabs. The tabs slide through slots in the plastic frame, and are clamped in place by the screws; an ingenious arrangement that avoids easily-reamed screw holes in the plastic. It's actually pretty easy to reassemble the Little Cute, but that wasn't the first thing I thought when all those tiny bits fell out. Anyway, here's the tight little nugget of electronics that's inside. Most of the frame looks like metal, but it's just plating on the plastic. I ran out of courage at this point, so you won't see any more of the V-330's giblets. I didn't want to rip loose the fragile ribbon cable connecting the screen. The visible memory chip is a Samsung; I don't know what the main chip is. 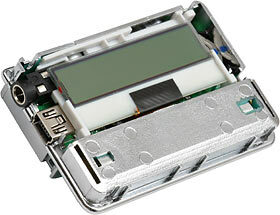 The Sunrich player has a more traditional two-screws-and-several-plastic-clips case design, and inside there's a plugged-together double-layered circuit board sporting memory and a main chip both made by Samsung (the main chip's labelled 3FB42FXZZ-TXRF, but Samsung's semiconductor site professed complete ignorance of it). Cheap this player may be, but nasty it is not. It's pretty much impossible for a portable MP3 player to contain the sort of nasty brown single-sided discrete-components wire-linked splodgily-hand-soldered circuit board that you'll find inside many cheap electronic gadgets. There just isn't room for that sort of thing, given the complexity of the circuit and the space there is for it. 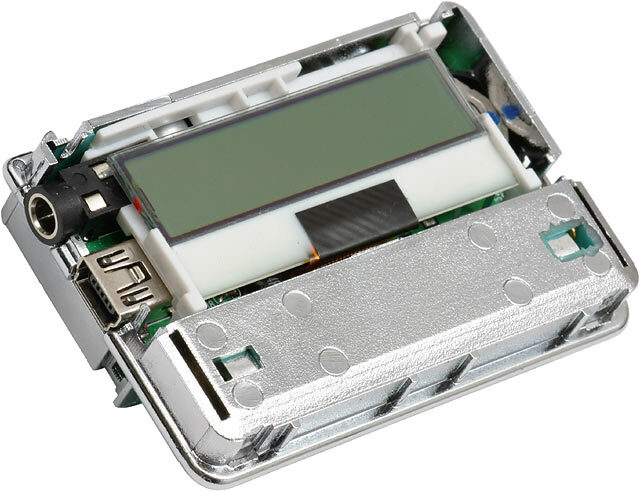 But it's still possible for larger components in an MP3 player to be poorly installed, for button switches to be super-cheap, and for the board-to-casing fit to be lousy. The Sunrich player has no such flaws. After I'd taken Dan apart and put it back together, the backlight deactivated at one point while I was doing listening tests, which led me to think I'd busted a wire. But turning the player off and back on brought the backlight back, so I guess it was a firmware bug. It only happened once. At first sight, I expected the Vmax V-330 to have limited features, be hard to use, and cost too much. That's usually the story with tiny jewel-like gadgets. Well, it's got lots of features, it's about as easy to use as a player restricted to five control switch inputs can be (it could use another couple of buttons; there's room), and it's actually quite cheap. 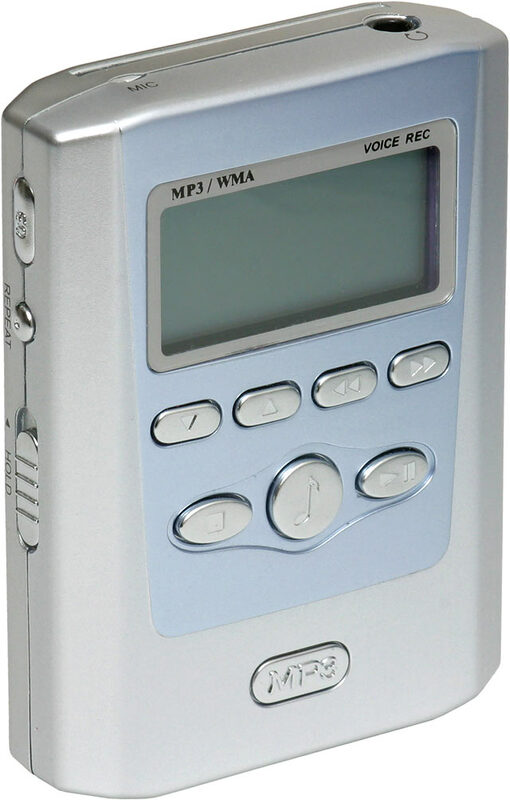 If you want more than 120-odd megabytes of space on your Flash-RAM MP3 player then this small version is not for you, but the thing does have a radio, so you're not stuck with the same 121Mb of tunes over and over. Dan is, of course, even cheaper, and works just fine, and can be converted into a 256Mb-equivalent player with little extra expense. 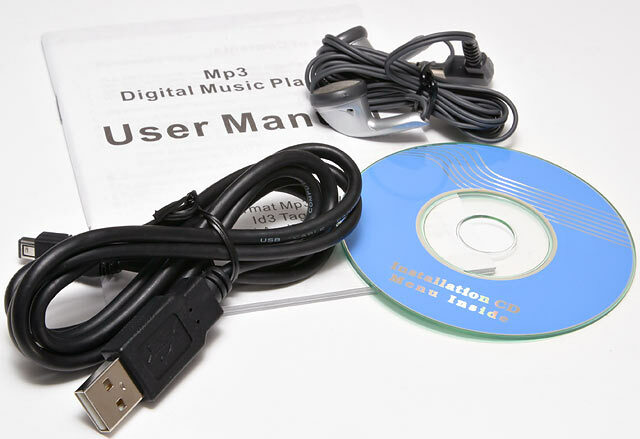 If you've been looking for a cheap and cheerful MP3 player that actually works, and especially if you've got a 64Mb or 128Mb SmartMedia card spare, this player's absolutely brilliant value for money. Well, when it's got a name like that, what else could I say? Aus PC Market don't sell these products any more (click here to see their current mp3 players). Here's another funny little player with some tricks up its sleeve. There's a lot to be said for portable headphone amplifiers. Especially ones that look cool.